Melody writing can be one of the most challenging parts of song writing. Melodies can say more than words at times. The power of a good melody, whether it’s sad, happy, moody, aggressive, or anything else, is extreme. In a way, the language of music can speak and communicate more effectively than words. I’m sure you can remember a moment where just hearing a few seconds of a piece of music, completely transformed the way you were feeling. It’s amazing when you feel the full effect of music. You don’t need to do anything, think anything, to feel the powerful emotions that runs through your body. So it goes without saying, those who can write an irresistible melody have a truly sought after skill indeed. Now the purpose of this article is to teach you this skill. So if you are yet to experience the thrill of creating a melody that can deeply influence a person in a matter of seconds, don’t worry! 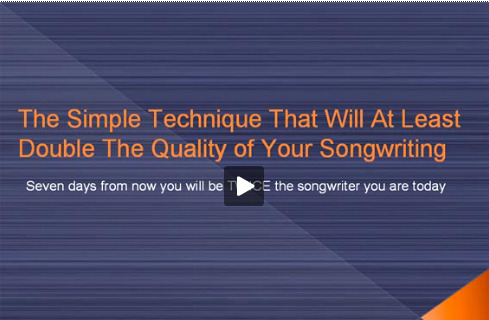 What you’ll learn here will give you what you need to develop the ability to write a stunning melody. Also, if you are already talented in this area, what I’m about to show you will make you better. Now, what I’d like to do now, is refer you to some very valuable resources that exist on this website. These resources have been constructed specifically to teach the art of melody writing. Now before I refer you to these resources, I must also mention, if you are passionate about attaining full mastery over the art of song writing, you must check out the song writing course, The Songwriting Genius Within You. This course has been constructed using principles that create enhanced creativity, and they are based on the techniques and methods the musical geniuses of the world use to create their masterpieces. After going through this course, you will truly be able to write both music and lyrics that inspire, and touch people at a very emotional level. So far, many hundreds of musicians have taken the course, and the results they have been getting have been unbelievable to say the least. Now, let me introduce you to some resources that teach the art of melody writing. First, there is a video that I shot fairly recently that goes through three very effective melody writing techniques. These techniques are very effective and you’ll find that within a few short days of using them, your melodies will dramatically increase. Secondly, if you prefer to read, you can view the “article version” of this training by clicking here. Be sure to utilize these resources! There have been many years of research, testing, and tweaking techniques so they are ultra effective… and if you use them you’re bound to have massive breakthroughs in your song writing. Good luck and I hope you’ve taken something from this article.